GLOUCESTER LOCOMOTIVE SHEDS is the latest in a series of in-depth studies of motive power depots during the latter days of steam, looking closely at their changing engine allocations and operational responsibilities. At the time, Gloucester was a busy and fascinating rail centre where ex-GWR and ex-LMS (Midland Railway) routes met, each with main line passenger and freight services, local passenger trains and extensive freight trips providing an endless panorama of railway activity. The principal ex-GWR Gloucester Horton Road and ex-LMS (Midland Railway) Gloucester Barnwood motive power depots are covered in depth with their locomotive allocations, operational duties and changing responsibilities over the years fully described. Not forgotten are both depots’ sub-sheds at Brimscombe, Cheltenham Malvern Road, Lydney, Ross-on-Wye, Dursley and Tewkesbury along with the duties and local routes that they covered. This in-depth study is supported by over 200 well-chosen black and white photographs, many of which are previously unpublished, and each of the motive power depots covered are supported by detailed plans of the shed layouts. 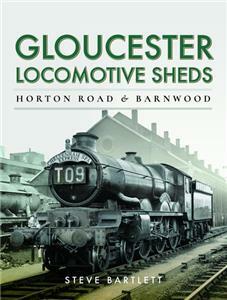 This new book follows the same author’s successful “Hereford Locomotive Shed” published in October 2017 and further books are planned in the series.